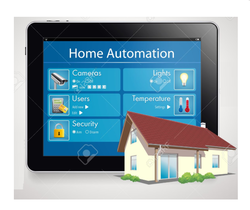 Pioneers in the industry, we offer home automation system, smart home lighting application and smart lighting app. from India. Max operating current 100 mA. Smart Lighting Control System for New or Old Wiring House. No Change in Existing Wiring. Just Fit the Kit in the Board as per No. Of Switch Requirement. Download “JioAAramse”App. from Google Play Store. Smart Home Lighting Application helps you to switch on or off any Electrical equipment connected to it, with Smartphone through Wi-Fi Connectivity. The system is well designed technically and with best quality material by Jyoti Telecom. ● Max operating current is 100 mA. ● Support Smart Link Function for both Android and iOS devices. On-Off Control of - Home Lighting, TV, Computer, Fan &Other Home Electrical Equipment. · Smart Lighting Control System for New or Old Wiring House. · No Change in Existing Wiring. · Just Fit the Kit in the Board as per No. Of Switch Requirement. · Download “JioAAramse”App. from Google Play Store. · Indigenous Design and Developed. · Control Your Home Lights and Equipment with Smartphone through Wi-Fi. · Reasonable Price as compare with Imported System available in the market. ¿¿¿ Max operating current is 100 mA. ¿¿¿Support Smart Link Function for both Android and iOS devices. Home Lighting, TV, Computer, Fan &Other Home Electrical Equipment.